The 2015 -2016 year was another busy and successful one with various talks, a charity concert, two shows, education seminar, stud visit and the beginning of a new progeny competition. The first of the meetings been held in October was full to the brim with no less than the Welsh Pony and cob President Mr David Harris of the Pennal Stud. Dai a regular supporter of our association gave us a very enjoyable encounter of his family history and their involvement with Ponies and Cobs and obviously spoke about the Pennal Cobs, on conclusion of the evening, officials of the association presented Dai with a cheque of £500 towards the Presidents fund at the AGM. The November meeting was a forum, the Welsh pony and Cob Society Council had decided that holding their forums within associations should be more beneficial and economical with the association inviting neighboring associations and it was open to all WPCS members. The trustees who attended the evening was the late Geraint Hughes (WPCS Chairman), John Kirk, David Roberts and Stewart Franklin they were more than happy to answer within their remit any questions or concerns that we had within our Society, which led to a lively and enjoyable discussion. It was lovely to see so many once again at the annual Christmas dinner and points presentation at the Rugby Club. Mr Gethin Morgan led us through presentation as always in a professional manner, and taking supreme champion was the Davies family of Henfynyw Stud with Henfynyw Magpie with reserve going to Mr Arnold c/o Corscaron Stud with Capcoch Caroline. January was an inter-association quiz night, with Daniel Morgan of the Parc Stud as Quiz master. Carmarthenshire Association proved to have the most brains on the evening, and won the prize of £20 but very kindly gave it back to our association. Due to unforeseen circumstances our guest speaker for February Mr Swistun could not attend, however we were very grateful to one of our committee members who stood in at very short notice. Mr Daniel Morgan of the Parc Stud gave us a very enjoyable presentation on the history of the Morgan family and the Parc welsh ponies and cobs. A lovely evening was had on the 1st of March at the Rugby Club in Lampeter with members and friends, the Club provided us with lovely traditional cawl and dessert before Dyfan Ellis Jones from Llangwyryfon YFC who is also from the Pantlleine Stud entertained us with his power point presentation following a visit to America on an exchange with the YFC. April was as usual our Annual General Meeting followed by a talk with the outgoing WPCS Young Ambassador. Mr Gareth Watkins gave us an encounter of his time in the role and a little about his life history. During April we also held an educational Seminar for both In-hand and Ridden at Cel Aeron Riding School, numbers were rather low on the evening, but those present benefitted in an educational and interesting talk with Geraint Thomas and David Jones of the Telynau Stud. There was a nice selection forward of examples of the five sections and the committee is grateful to all those who provided ponies and cobs on the evening. August saw a new competition being formed!! Following the dispersal of the West Wales Breeders Association they kindly asked us as an association if we would have use for all their trophies, as most of them had been kindly donated by the Studs of Ceredigion at the commencement of the West Wales progeny competition. After thoroughly discussing the idea, it was decided to hold the competition within the Ceredigion association but invite all WPCS members residing within the Counties of West Wales to participate, that being Ceredigion, Pembrokeshire and Carmarthenshire. Considering it was the first time for us to hold the competition the response was good, with sufficient entries to hold a two day competition which was very ably judged by Mr Brian Foster of the Gerrig Stud. It was the committee’s decision to announce the results at the Christmas dinner so we will look forward to that. A coach full of members and friends headed towards Welshpool for the stud visit in September with the first stop at the Bronheulog Stud, we were greeted by Mandy and Vicky Andrew with a welcoming cup of coffee and refreshments before seeing some lovely Section B’s in hand followed by a tour of the fields. We then moved on to the home of Dorian, Michelle and Medi Lloyd of the Perthog Stud who had kindly invited us for lunch. We then had a lovely display of Cobs all brought to us, including their 2015 George Prince of Wales winner, Perthog Gwenan Mai. Members browsed around to see the cobs in the stables before ending the afternoon with refreshments and a chat on the lawn in glorious sunshine. The third Friday evening of September at the Parc Stud has now been made permanent fixture for the annual show, and we are truly indebted to Daniel and John Morgan for allowing us use this fantastic venue, again like the summer show we were blessed with a great turnout of quality foals across all the Sections. We had four young judges this year and were all confident and undertook their roles with dignity. The evening’s president was Mrs Llinos Spenser past summer show Secretary and a great supporter of the association. We immensely appreciate her donation on the evening and Mrs Spenser’s choice of Supreme Champion was the Section C Ilar Arragon property of the Davies Family and Mr Owen Griffiths, Ilar Stud and in reserve was Mrs Julie Evans’s Section D Champion Haighmoor Satellite. The committee would like to acknowledge everybody who has supported the association in any way during the year. The Ceredigion Association is celebrating its 25th year in 2017 and we have been granted a Silver medal for the summer show in recognition of this, so we hope you will all support us to make it a show to remember. The 2013-2014 year was yet again a busy one with various talks, the annual charity concert, Christmas dinner, an educational seminar, a stud visit and two shows. The Autumn programme was opened by the WPCS President Mr Edwin Prosser who gave us a very interesting talk and slide show of his time working as stud groom at the Cotrell Stud, and then the success of his own Mintfield Stud with his highlight taking Section B Champion at the Royal Welsh with his homebred mare Mintfield Songthrush who also qualified for HOYS on the same day. Also during October the annual Charity concert was held at the theatre in Felinfach with the proceeds going to both the Children ward’s at Aberytwyth and Glangwili hospital. November was again an entertaining evening hosted by Miss Rachel Evans of the Gornoeth Stud giving us a detailed explanation of her work with The Countryside Alliance. As always the annual Christmas dinner and points presentation is held in December this being the first time it was held at the Granell Hotel, a lovely evening was had by all present and it was lovely to see some of our younger members being awarded during the presentation and then a pleasure to watch them dance the night away. The points presentation was yet again popular with the champion being a tie between Cilsane Misty Maid property of Euros and Janet Davies and Trehewyd Gwenfron property of Mr Dai Evans. During the evening Mrs Llinos Spenser was presented with a gift in recognition of her retirement as summer show secretary, a task she had taken since the show was formed. 2014 saw some of the worst storms ever on the Cardiganshire coast and as the high tides were at theirhighest in the Aberystwyth area the Ceredigion members met on the first Monday of January at the WPCS office and were greeted by staff for a tour of the office and the museum followed by a sit down and refreshments watching some older DVD’s which amused the younger generation of the change of fashion and hairstyles from then to present, and for the older ones present was the shock of how they had changed over the years. Mr John Kirk of the Donys stud came to entertain us in February with an insight of how they became involved in Welsh cobs, with some very interesting stories about their time totting around the streets of London, followed by their many trips down to the Llanarth sale where they made lifelong friendships before deciding to move to Wales to make their home. It’s always a traditional ‘cawl’ night in March with entertainment to follow, this year by the sister and brother duo Fflur and Rhys Griffiths who very professionally entertained us accompanied by their mother Menna on the keyboard. An educational seminar was held in April at Cel Aeron Riding school, where Mr Peter Jones of the Menai Stud spoke about Breed type and conformation and Mr Robert Parker Jones did the ridden presentation and spoke about the way of going, it was lovely to see such a good turnout of members and non members on such a cold evening, the association were very grateful to all those handlers and riders who kindly brought their horses and ponies on the evening at no charge to the association. Also during April was the AGM followed by a short talk from the retiring WPCS young Ambassador Miss Maggie Simmons. The association’s annual Foal show was held at the Parc Stud by kind permission of Daniel and John Morgan on the 19th of September at 5.30 in the evening, following the committees decision to change the day from a Saturday to a Friday evening due to various events clashing definitely proved a success, with a great turnout of quality foals forward. The President for the evening was Mr John Green, Steffan Stud a committee member and a great supporter of the Association. His choice of Supreme Champion was Richard and Gethin Morgan’s Bay Section C filly Ormond Ruby’s Delight with the grey Section A filly Dargale Vanity Fair the property of D and G Jeffries, taking the reserve Supreme Champion. The committee would like to acknowledge everybody who have sponsored or helped the association during the year, and look forward to meeting old and welcome new members to the new venue at the Lampeter Rugby Club. Ceredigion Welsh Pony and Cob Association meet at the Grannell Hotel, Llanwnnen on the first Monday of every month between October and April. Once again this year we had a varied programme of events, with shows and Stud Visits. Once the summer shows come to an end and the days get shorter all members start coming together for our monthly meetings. In October our Guest Speakers were equine specialists Lisa Durham and Phillipa Hughes of the Dyffryn Tywi Equine Clinic. We had a very interesting talk accompanied with slides outlining the work undertaken by their practice. As an Association we always endeavour to raise money annually for a charitable cause. Air Ambulance benefited from our efforts last year; however money was raised for another worthy cause this year –Marie Curie Cancer Care. They received £1000 from the Association as a result of a very successful concert with John ac Alun, a Country and Western Duo and Côr Clychau’r Fedwen from Llanddewi- brefi Our President for the evening was Mrs Wendy Lloyd, Geler Stud and the evening was compared by Mr. Ifan Gruffudd, Tregaron. A forum was held during our November meeting, an event which proves very popular with members. We had a varied and interesting Panel which consisted of Pauline Howells Gleiniant Stud, Eric Davies, Maesmynach Stud, Ifor Lloyd, Derwen Stud and Peter de Rade of Zonneweide Stud. It was an interesting evening with various viewpoints which fuelled good debate. As ever in Ceredigion we always enjoy socializing and the Christmas Dinner is no exception. This was held early in December at the Falcondale Mansion Hotel. During the evening we had the presentation of our Annual Points Competition. The numbers entering increase year on year. The competition is based on points being given to an animals’ placing in a maximum of 10 shows in Ceredigion. We are very pleased that small shows are supported in this way by our members. The Overall Champion and winner of the Ewina Colegate Trophy was Gweundir Dafydd of the Tyngwndwn Stud and reserve was Trehewyd Ifan Ho, owned by David Evans, Clogfryn. In January members ventured out after the festive activities and gathered for a presentation by WPCS President, Mr Len Bigley. His presentation outlined his years with Pauline Taylor at the Llanarth Stud before taking the stud forward into later years. It was interesting to note the vintage film he showed of early stallion classes at Lampeter and the Royal Welsh. Unfortunately the February meeting was cancelled due to heavy snow, however we made up for it during our Cawl evening in March which had excellent attendance. It is a tradition in Ceredigion to celebrate St David’s Day in our March meeting. So, true to form we all gathered at the Grannell for Cawl and Rice Pudding with excellent entertainment provided by Joy and Georgina Cornock of Fishguard. The April meeting sees us bringing our winter programme to a close as members prepare for the spring and summer events. Following the AGM a talk was given by the WPCS Young Ambassador, who provided a young person’s insight to an important role within the Society. Following the end of our Winter programme, we held in June our second Summer Medal Show at Llanllyr, Talsarn. The Supreme Champion of the show was awarded for the second time to Nebo Stud with their Section D Champion brood mare Nebo Miss Maple. She was selected by the show President, Mr Dai Harries, Pennal Stud. The Stud visit in early September saw members meeting up again. The Association headed north this time to Anglesey and a display of welsh ponies and cobs was provided by the local Association. We also visited numerous Studs on the island who provided an excellent welcome. As the latter part of the summer disappeared under rain and high winds, Ceredigion WPCA had a lovely day for its annual foal show. 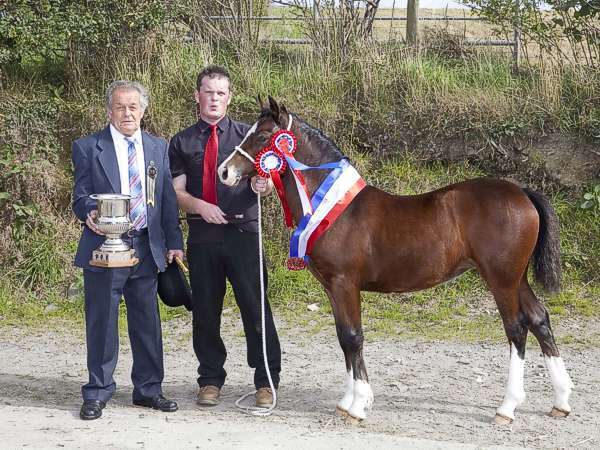 After a successful show at the Penparc Stud by kind permission of the Morgan brothers, the Supreme Champion was awarded by Show President Mr Dewi Jones of the Trem-y-mor Stud to Brohedydd Flash Lady, owned and exhibited by Huw Jenkins, Brohedydd, Pennant.